The new Apple TV is out today, so what can you expect from its new streaming dream? Tim Cook has revealed you're going to be able to get your hands on the new Apple TV this week, and today it's finally gone on sale. We've now got final pricing for the UK version of the new device. The 32GB unit is on sale for £129 and the double-sized 64GB version is doing the rounds for £169. With 4K competition for the set-top box crown from the likes of the new Amazon Fire TV and Nvidia's SHIELD, the new Apple TV has got a fight on its resolutely HD hands. We've been waiting for a proper sequel to the original Apple TV for years, with only relatively minor, iterative upgrades filling the intervening years. But 2015 is the year for the fourth generation of Apple's diminutive streaming box to finally hit our lounges and we're desperate to get our hands on it. The prospect of a new Apple TV was dangled in front of us prior to the WWDC event earlier this year. It was particularly galling to have precisely nothing to show for our excitement after hearing everything about Apple Music, iOS 9 and El Capitan - especially as the WWDC invite appeared to show a suspiciously Apple TV-shape at its heart. But with the Apple announcing the new box on September 9 we've finally got a brand new Apple TV. So, what is the new Apple TV? The Apple TV first appeared in January 2007 - that makes it older than the iPhone, but the device has always felt like something of an afterthought as far as the Cupertino company is concerned. Major updates came in September 2010, March 2012 and January 2013, but we haven't seen any significant hardware upgrades since. It's a device aimed at making streaming video content direct to your TV as easy and obvious as all of Apple's device design choices. The new device is said to be a much more powerful box, running Apple's A8 processor, and comes with either 32GB or 64GB of internal storage. While the current Apple TV is a pure streaming device the extra storage of the new device is there because Apple is claiming "the future of TV is apps." But you'll also need all that space for the games the new App Store will offer. What software does the new Apple TV run? This is probably the biggest single change with the latest version of the Apple TV - the inclusion of an adapted version of Apple's latest mobile operating system: iOS 9. The Apple TV software gets a new name: tvOS. As well as being based on iOS 9 it will also borrow from the El Capitan, the latest version of the OSX operating system. With iOS being adapted to the Apple TV device it means there is a host of apps ready made for the wee streaming box. All the existing big content streamers have iOS apps already out there and with the big hitters working on tvOS apps - Periscope has been outed as one of the first - we expect many to translate easily to the larger scale of a big-screen TV. There may be difficulty with some specifically mobile apps, such as Sky Go, where it doesn't allow the outputting of content onto a separate device. So don't expect all your favourite iOS apps to be able to make the journey over to the new Apple TV's tvOS setup. Of course one of the companions of iOS is the Siri personal assistant and, with the new remote control design, we'll be able to chat away to our Apple TV without having to get bogged down in text menu after text menu anymore. Part of that will feed into the new Universal Search. This powerful new feature will allow Siri and iOS 9 to delve into installed applications and feed back with what content they have to offer. Ask the Apple TV's Siri about watching a new movie and she will nip off and track it down in the streaming applications you have access to as well as finding it within the iTunes store too. You'll also be able to search by actor or director, as well as other targeted searches such as genre, etc. What about Apple's live TV venture? There has been a lot of speculation about Apple entering the streaming TV game itself, rather than purely supporting the streaming efforts of others. It was reported the original unveiling was set to partner up with Apple Music at WWDC, but the struggle to nail down licensing forced Apple to push the announcement back. We don't though expect there to be any news about Apple's TV streaming venture to bolster up the launch of the new Apple TV this time either, but it looks like the company from Cupertino wants to at least get the hardware out this year. The idea for the streaming TV service is to allow you to bundle together channels you want and have them streamed directly to your Apple device as opposed to paying out for hundreds of channels, most of which you'll never want to watch. With Apple reportedly wanting a 30% cut from the content providers getting this past the networks is the big challenge. The TV streaming content has been held up while deals are struck with the big US TV networks - Fox, CBS and NBC - and it looks like a 2016 launch is more likely. Though there may be a significant delay for us UK-based folk as it looks like all the legal effort is going into getting the US networks on board. But with the success of Apple Music and its bespoke content, in both radio and video forms, it wouldn't be beyond the realms of possibility for Apple to go all Netflix/Amazon and start producing its own TV shows and even movies. What's the new Apple TV's remote control like? Another big advance for the new streaming box is the touch-sensitive remote. The new remote control is this time eschewing the classic aluminium aesthetic for a black approach, more in line with how the Apple TV box itself looks. But image isn't everything and so functionality is king with the new control. As well as the multi-touch touchpad there will also be physical controls on there too - a traditional volume rocker as well as a home button and another for waking up Siri. That's not all though as we should also see some Wii-esque motion-controlling going on too some wavy-arm gaming too. So can we game on the new Apple TV then? Well, that's the plan. Apple is looking to make games a major selling point for the new Apple TV. Of course we don't expect the next Fallout or Assassin's Creed games to appear on the Apple TV - and don't expect to be streaming games either - but the casual gamer, who's already been playing on their phones and tablets, will be a definite target. And with that Wiimote-style controller capability we might see some funky Nintendo-esque games, like Beats Sport, coming out for the new Apple TV letting you wave your remote at your screen and game away from the comfort of your sofa. There is also an interesting cross platform angle to this too - where you can buy a game and it will be available across both your iPhone or iPad as well as your Apple TV. Start playing a game on your way home from work and when you get in you can pick right up where you left off on your new Apple TV. That's quite a bonus in gaming terms. How much will the new Apple TV cost? This is the slightly tricky, though mostly inevitable, part of the equation: cost. The current device is a little short of £60, though as a rather limited, niche device right now you can understand it relative cheapness. Enter the new Apple TV with a price starting at £129. That will net you the 32GB version, but there is also a second, 64GB version which will set you back £169. When can I get a new Apple TV? 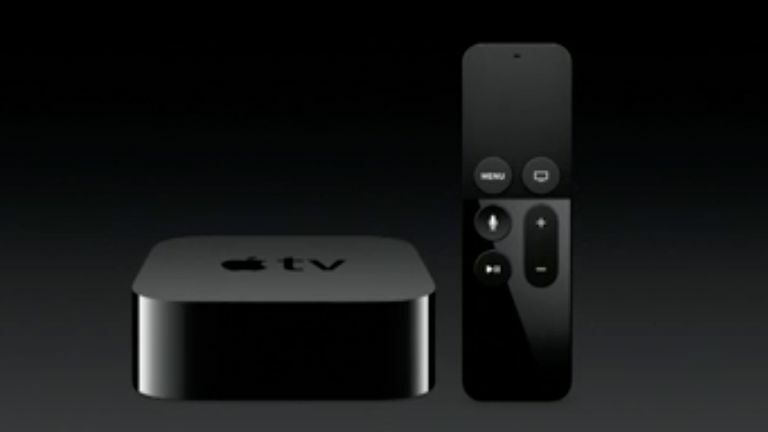 The new Apple TV will go on sale in its two different guises Monday October 26, across eighty countries. By the end of the year that ought to be up around 100 different countries.